It’s a day out at Eton College – with a tour included for adults. 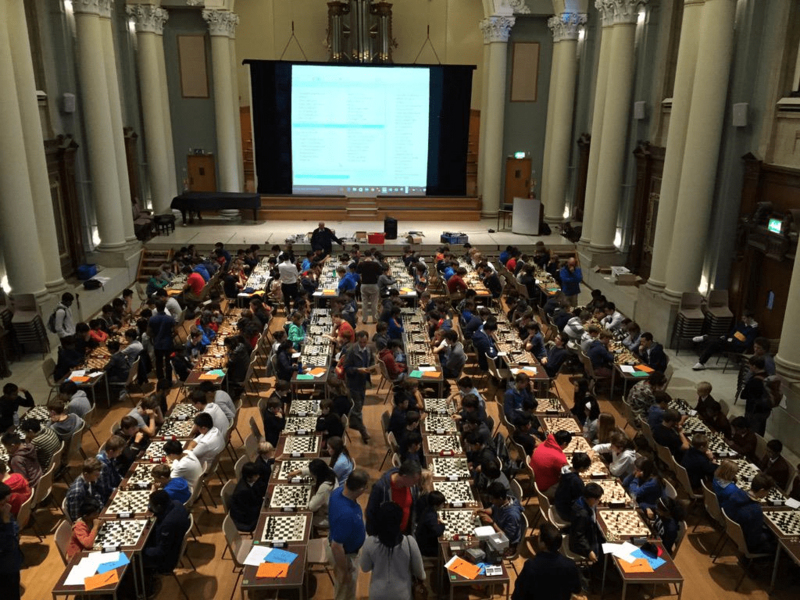 It’s 48 teams of six from 37 schools from right across the country (and even an international element) – dozens of games of chess all going on at once. And somehow, it all comes together with such amazing speed. Volunteer schools bring sets, boards and DGT1000 clocks and the whole thing gets set up in minutes and then we’re off, always slightly late but never mind, and five rounds later everything disappears even faster than it was set out. Of course, it’s not mysterious and is a result of much organisation from Neill Cooper, a man who makes the Duracell bunny seem lethargic. 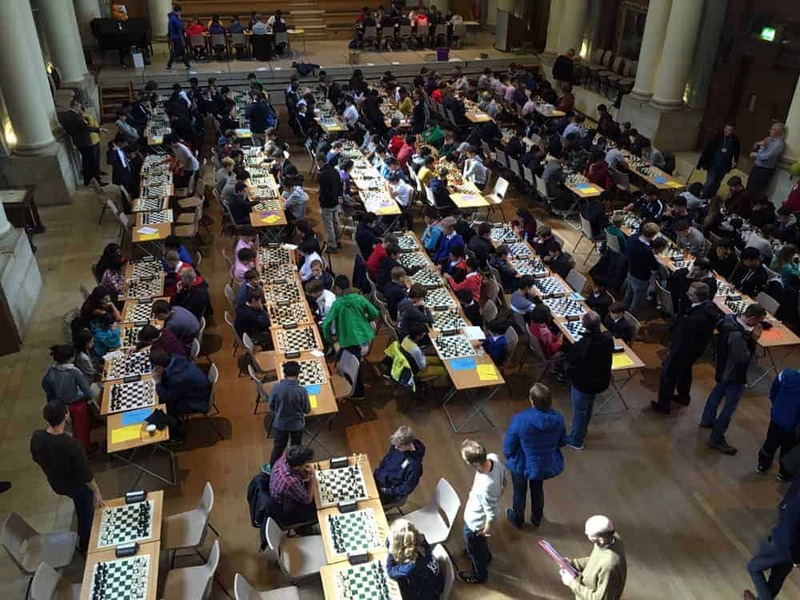 2018 was my fifth visit to the Eton Rapidplay. The first time we came, my school had only five rated players and only two who played regularly. Forever our board three has been known as the ‘death spot’ – they are usually playing against someone much stronger and get crushed even when the team wins. 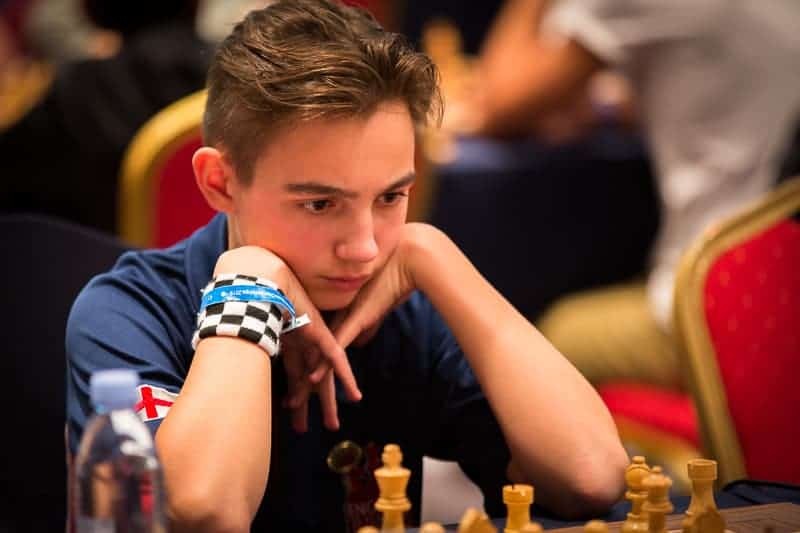 A great feature of the tournament is that you have some of the strongest junior chess players at one end of the room and some who have never played with clocks at the other end. 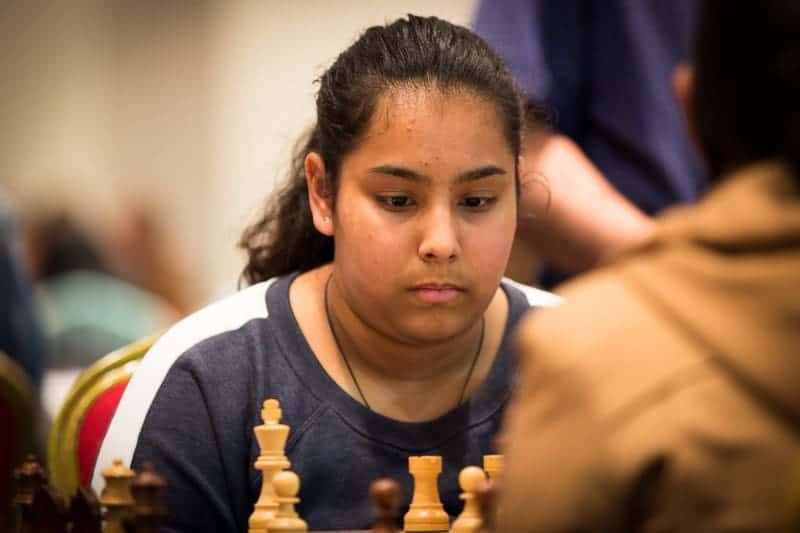 The first couple of rounds can be very one-sided; the team returns beaming from turning one school over, not realising perhaps that it means their next match may pit them against a team who will do the same to them. Before long it has evened out and rounds three to five see some very competitive chess played – at all levels. Team chess can be a great leveller. 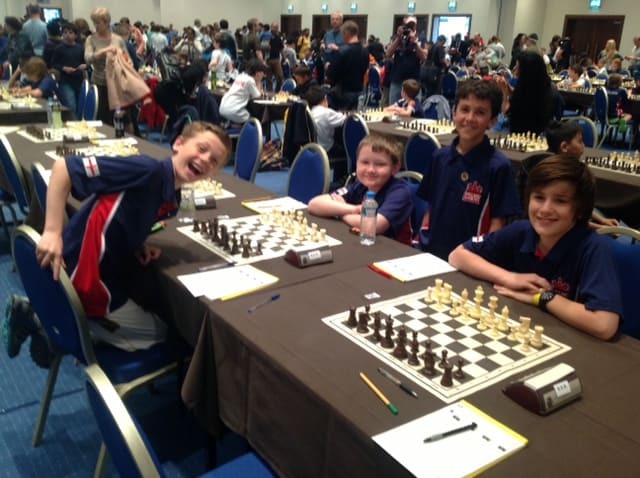 Before a round starts, a team of older teenagers can be seen grinning with the anticipation of victory as their nine and ten-year-old opponents sit down in front of them. Then they discover that there are some very strong nine and ten-year-olds and, crushed 6-0, they retreat to the team room with bruised egos. Well, it gets them used to it when they are adult players I suppose. It’s never easy being the team manager at Eton. My A team revel in telling me which opening they are going to play in advance – it usually involves an early g4 – displaying such levels of hubris that I know I’m going to be saying “I told you so” in 20 minutes time. 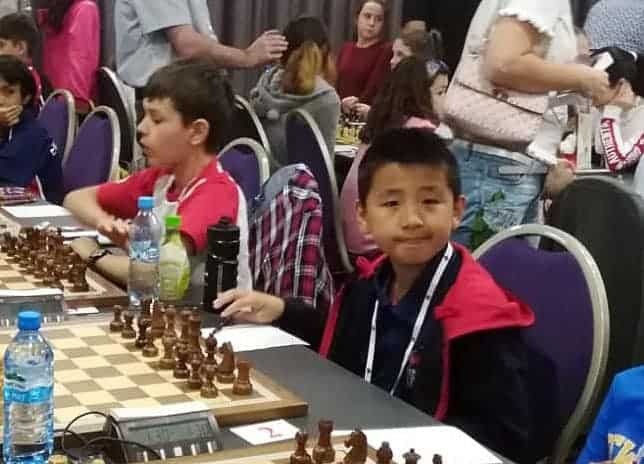 On a couple of occasions, the final match has been critical and I have to stress out quietly while a player breezily plays through an endgame a pawn down. Now we have more than twenty rated players and I have to play a careful political game of who to leave out. Everyone loves the Eton Rapidplay. 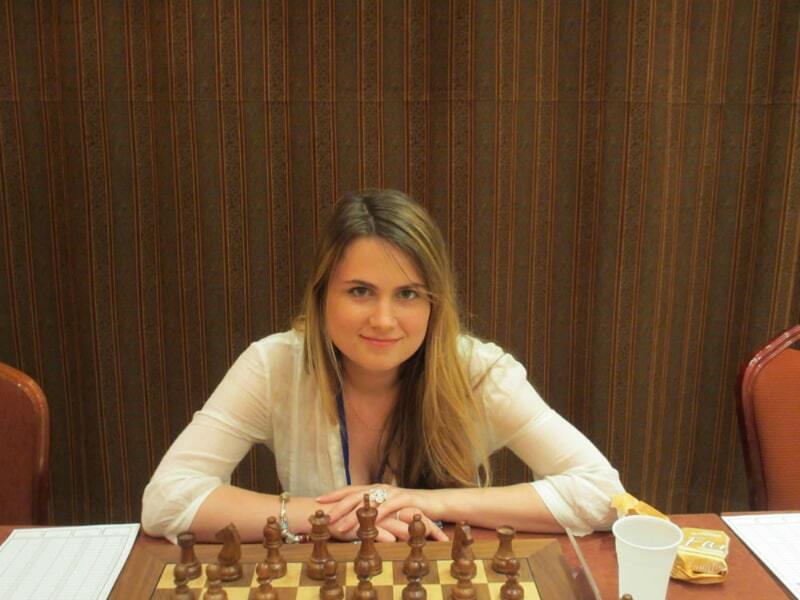 The atmosphere is very friendly and it is the most laid-back tournament I have been to. 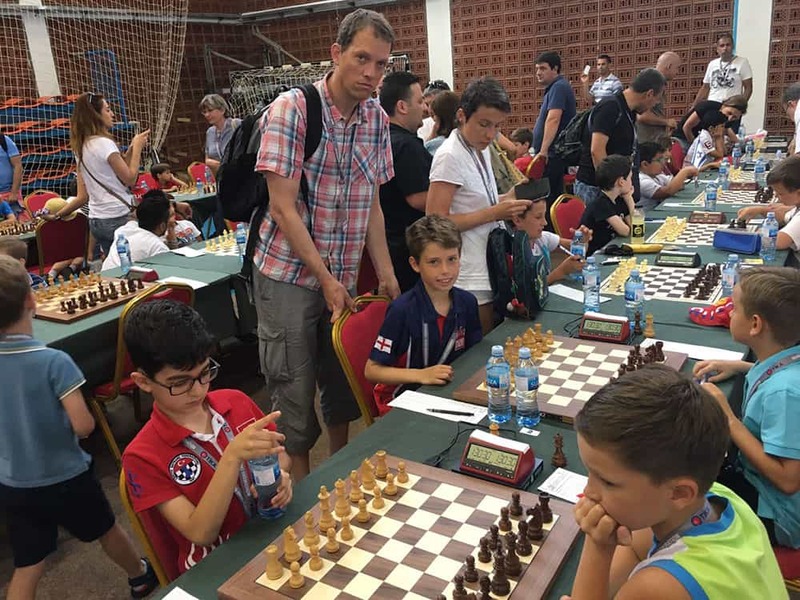 The chess is competitive but, being rapidplay, the top players aren’t too worried about their rating and aren’t afraid to experiment. Parents chat with teachers, teachers chat with other teachers (probably about education) and the children get on famously. 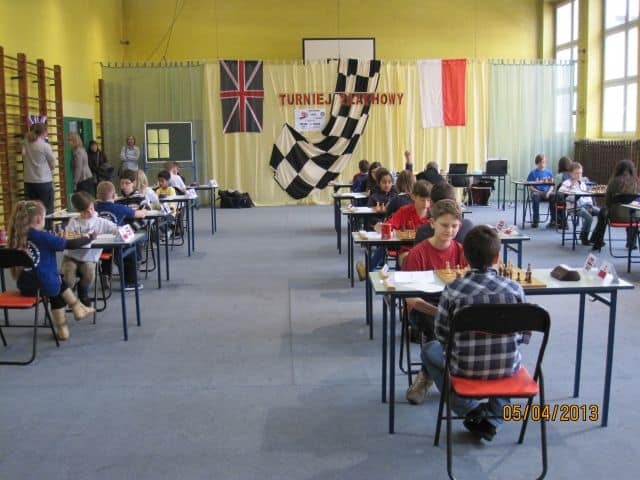 It signals the start of the chess ‘season’ and a chance to introduce your new players to school chess. Everyone keeps coming back – I see a lot of the same faces each year – and they bring more and more players. That has to be good. Event Format: 5 round Swiss rapidplay tournament. Digital chess clocks. All moves in 20 minutes + 5 second increments from move one. All games will be ECF graded. Teams: Teams will consist of 6 players in school years 7 to 13. Schools can enter one or two teams. Squads can have up to 8 players with 6 playing in any match. Schools which have no pupils beyond year 8 are allowed up to 2 players from years 5 and 6. Reserve games: We may need to include a team of reserves in the tournament. We will also be able to play reserve games in the playing area and arrange for these games to be graded. 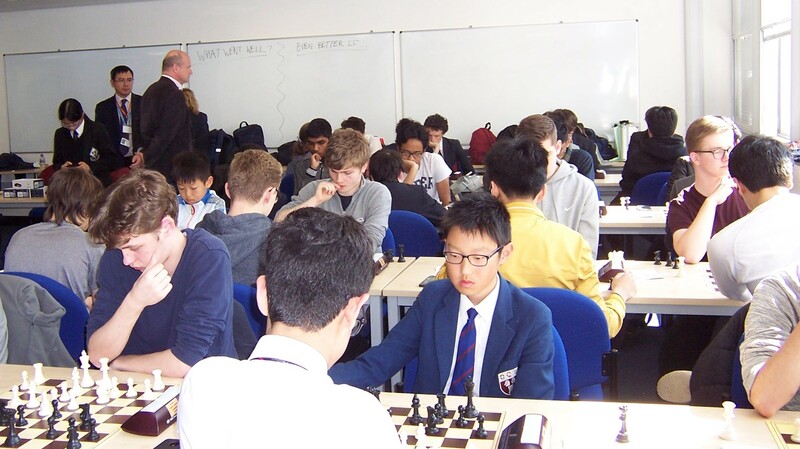 September 18, 2016 at Eton College – 5 rounds for teams of 6 players. Congratulations to Gonzaga College, Dublin on winning this exciting tournament by the narrowest of margins. Eton College hosted the fourth annual Secondary School Rapidplay Chess Tournament in their magnificent school hall. 250 players made up 40 teams representing 33 schools from fourteen counties, from Lincolnshire to Somerset, Warwickshire, Lincolnshire to Kent. 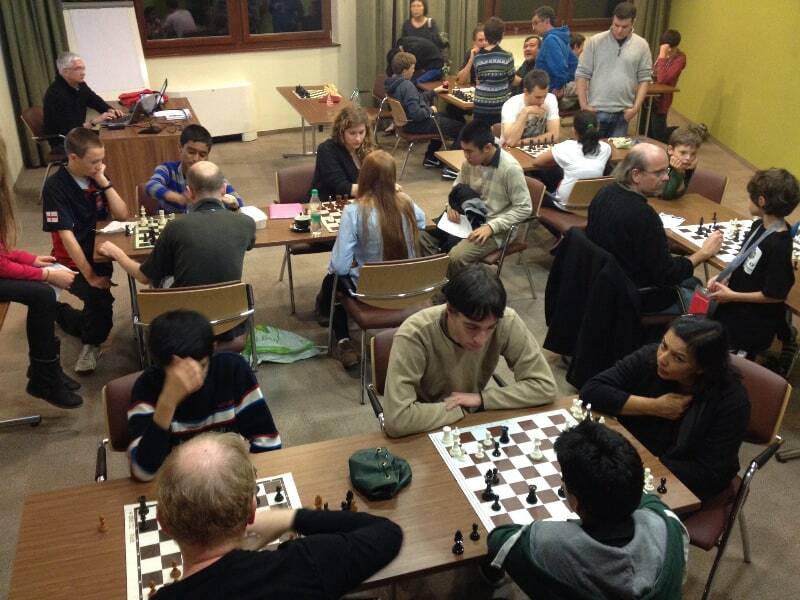 Over 600 rapid play games were played across the five rounds. 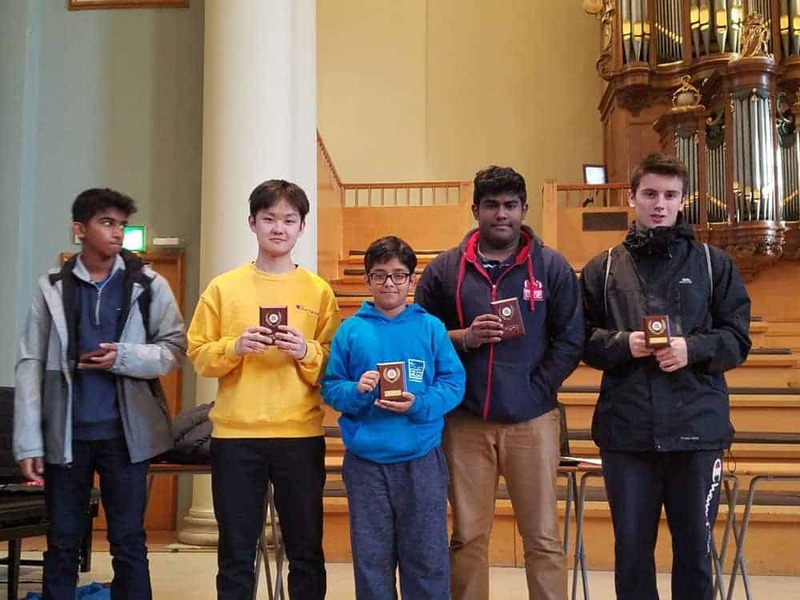 Schools featured included National School Chess Champions Haberdashers’ Askes and past winners Hampton School. As well as some very strong teams, there were many others of a range of strengths seeking to do their best. 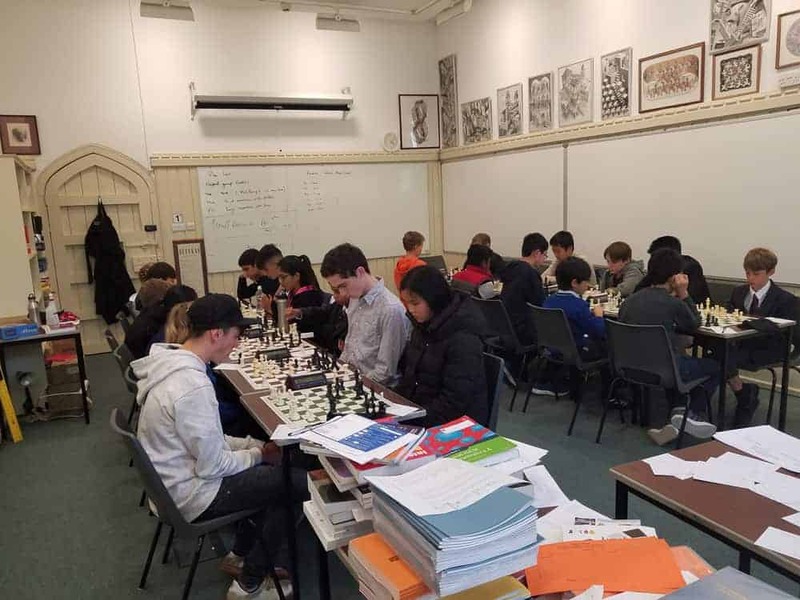 Whilst the top players were graded over 200, the median grade was closer to 100. The event was opened with a short address from Phil Ehr, Chief Executive of the English Chess Federation. Play went remarkably smoothly with any issues being quickly resolved by arbiters Chris and Matthew Howell. The draw for each round and scores were clear for all to see on an enormous screen at the end of the hall. The scoring system was based on games points (so every game counted towards the total) rather than match points. This proved popular with the weaker teams who found that their scores were increasing even when they were losing matches. Also the Swiss system lead to many close matches – half the results being 4 – 2 or closer, even though the first round matches were all more one sided than this. However, a downside of this scoring system was shown this year. Whilst Hampton won all 5 matches, including beating Habs, they scored a lower game point total. 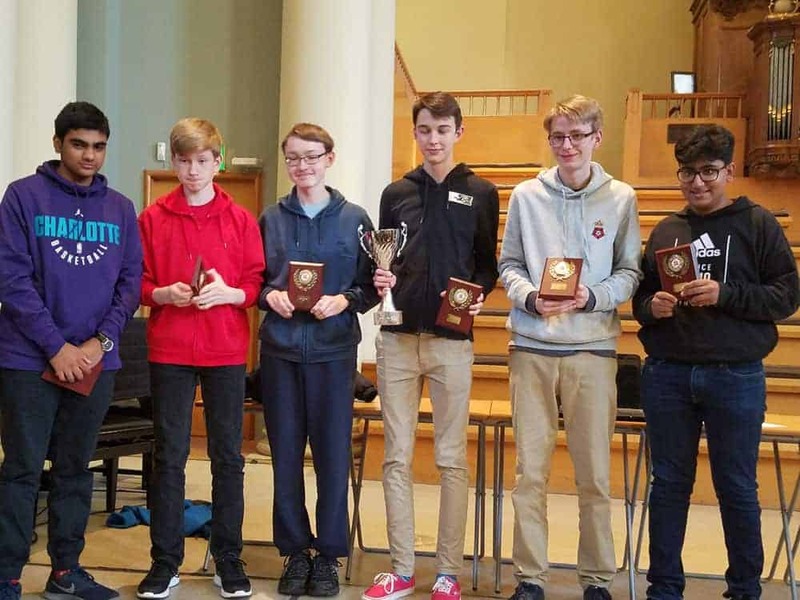 So whilst Hampton were match point champions, the game point (and therefore event) champions were Haberdashers’ Askes by half a point. Third, a further half point back, were QE Barnet with RGS Guildford a further half point behind. 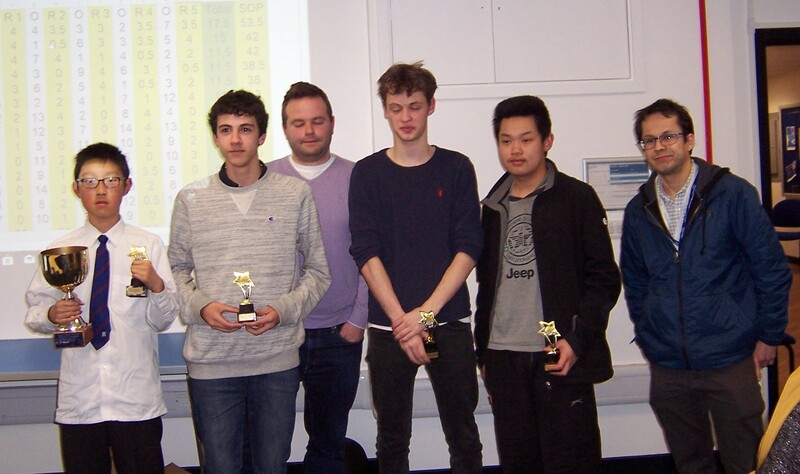 Fifth place was taken by King Edward VI Grammar School, Chelmsford in their best ever chess result. Sixth place were North London Collegiate, the best result that I have seen by a girls school team in an open tournament. 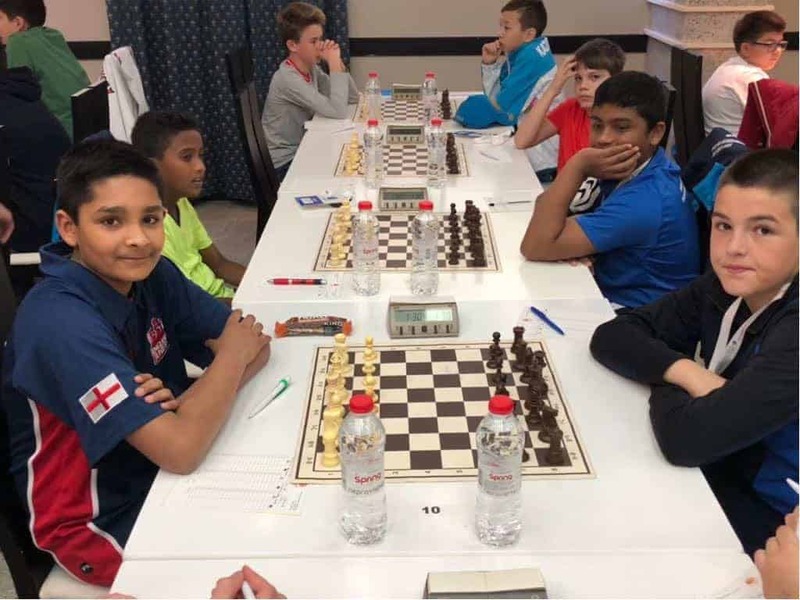 Seventh were City of London Boys School, making an impact as they return to school chess, whilst our hosts, Eton College, came eighth. 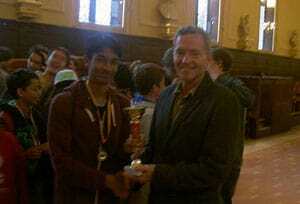 Prizes were presented by Dr John Nunn, world class GM and twice World Champion in Problem Solving. Below is some feedback I received from teams shortly after the event. I hope that the knowledge that even teams who came near the bottom still greatly enjoyed the event will encourage more schools to take part next year. “Just wanted to say thank you so much for a well organised event at a fabulous venue. I know a lot of work goes into making these events run well and to ensure that all the schools, children and parents have a good day. The team and parents certainly had a great day! Finally thanks to Eton College for providing fantastic facilities that is a draw for many schools. 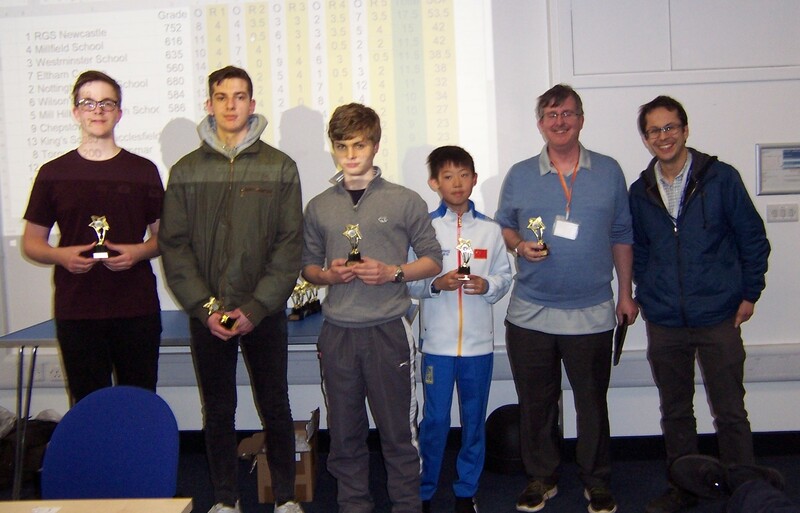 The inaugural ECF Secondary School Rapidplay Chess Tournament was a great success. 15 schools took part, some travelling over 2 hours each way, and fielded a total of 17 teams with 6 players in each team. There were lots of reserves so and 18th team was formed so that all teams played in all 6 rounds. 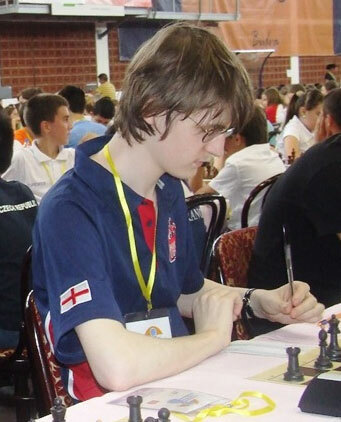 A total of 112 players played 330 games of chess, which have all been rapidplay graded. It cannot be said to have been a close contest for first place – a strong Haberdasher’s Askes first team won all 6 matches and scored a total of 30½ points. Two of their players, Ravi Haria and Roman Mitra, were the only players to win all their 6 games. 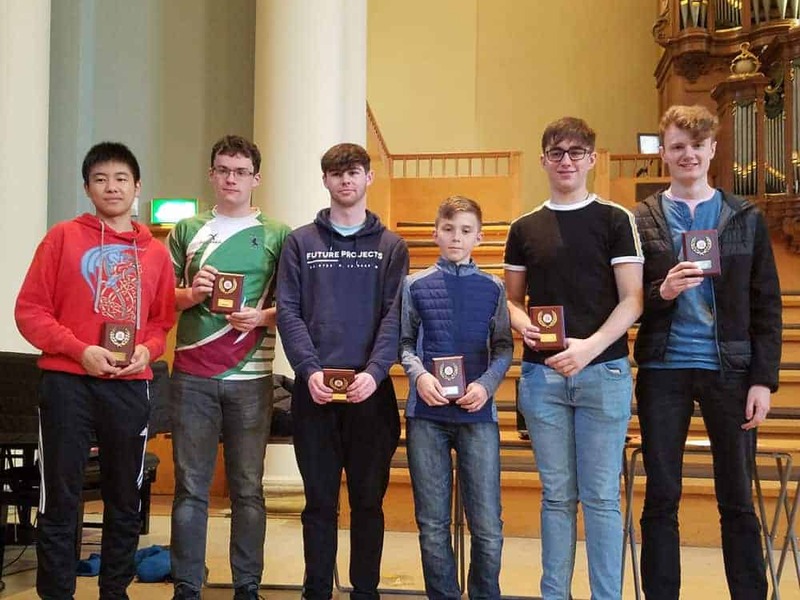 In contrast second place was a 3 way tie between Wilson’s School 1st team, RGS Guildford and Winchester College, all of whom scored 22 games points. The scoring system was based on games points (so every game counted towards the total) rather than match points. This proved popular with the weaker teams who found that their scores were increasing even when they were losing matches. Also the Swiss system lead to many close matches – almost half the results being 4 – 2 or closer, and 9 fixtures ended in 3 – 3 draws. Most teams thought the time for each round (1 hour) was about right, though slightly longer should have been allowed for the whole event. Everyone preferred playing in one large section rather than being split into smaller all-play-all sections. Some schools would have preferred the scoring to be done by match points not game points. Most teams would like to play in a similar event within the next sixth months, preferring Sunday to Saturday (to avoid clashes with other school events). Many schools felt that they may be able to host a similar event in the future. We are very grateful to Eton College for providing their facilities free of charge. One unique feature of the event was to hear the fantastic organ music at the end of their morning chapel service.